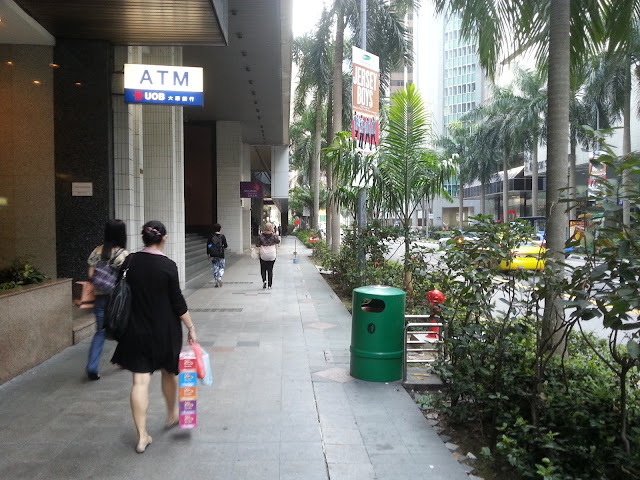 There is this dustbin along the pavement just next door to my office building. It is between me and my route to the MRT station. Everyday hordes of office workers gather around the bin to smoke. Some will lean against the wall of the building and some will stand in the middle of the pavement. Whatever it is, I have to walk through a tunnel of smoke almost daily to get to/from the office. A colleague fed up with the situation, repeatedly called the NEA only to be told by them that their enforcement officers found no offence of illegal smoking and could not do anything! So it was a lost cause for us until the new anti-smoking measures kicked in on 15 January this year. The following day after that, I emailed the NEA to "feedback" about the situation. And I got this reply. "2 We had conducted checks at both locations but no one was seen smoking within the prohibited smoking area. However during our enforcement checks, smokers at the non-prohibited areas were advised to be considerate and mindful of non-smoking commuters and patrons. We had also requested the stakeholder at 156 Cecil Street to move the bin further away from the building. 4. With the extension of the smoking ban on 15 January 2013, public areas such as covered walkways have been designated as non smoking zone. We are engaging the building management on the smoking ban and we will take the opportunity to remind them to ensure that no one smoke at the prohibited areas of the building. We will also continue to conduct enforcement checks at the site." Very efficient. I thought. Imagine my delight when 2 days later, the dustbin was removed! But the joy was misplaced! The smokers continued to smoke there. No dustbin? No problem. Just drop the cigarette butts on the ground. Anyway I shot off another email to NEA and they promised to send someone around to book the litterbugs. "Thank you for the email. We will deploy our enforcement officers to carry out checks and book anyone found littering the public areas". But guess what? The freaking dustbin is back! Yes I figured NEA think it is easier to let the smokers puff away then to either enforce the no-smoking rule or nab the litter bugs! The mess left behind by the smoker were atrocious. They not only dumped the butts everywhere, they used whatever objects they can get like the biscuit tin, drink cans and disposable cups, they left everything behind creating a big mess. And surprisingly, the mess was not cleaned up until several days later. Well the story didn't end there. Another few days later, a new dustbin appeared. I refer to your feedback on the above subject. 2. The area where the litter bin was located is not a smoking prohibited area. To alleviate the problem, we have tried removing the litter bin. 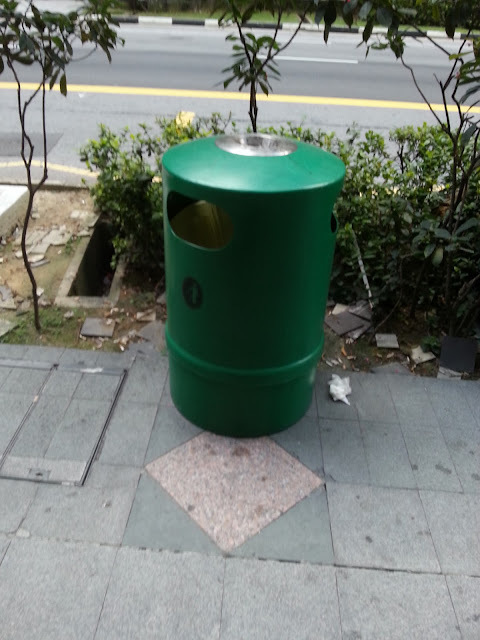 However, this was not feasible as we have assessed a need for a litter bin to be placed there." And that is their way of saying, we gave up. We can't beat the smokers so we going to let them smoke. Too bad for you! Aiyo.....how can like this de????? I believe there is a lot of 'hot spots' like this Koh. Aiyah, give the smokers a break lah. They already smoking around a bin, live and let live lor.